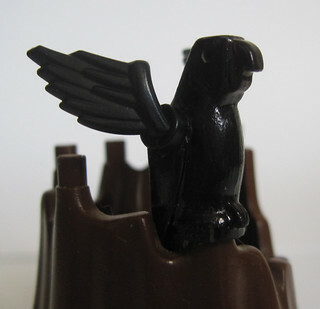 Classic-Castle.com • View topic - Updated Female Archer & modded Lego bird. Updated Female Archer & modded Lego bird. Also while playing around, I worked on this months ago, and while the end results aren't exactly what I hoped, I still think it looks good. The bird is the official Lego bird in dark gray that I used a black sharpie and paint pen on. I then drilled holes in the side of it to allow the wings to sit into. The uneven edge of the bird's sides made the holes imperfect. 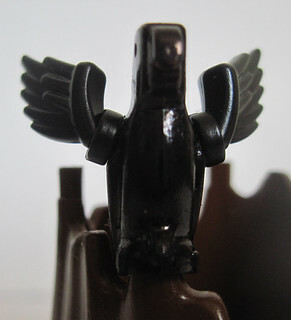 I glued in the Brick Warriors wings to keep them stable. I had hoped they'd just sit in there so I could turn them for different poses. I'm still happy with it and think doing more would be fun. Maybe a clay beak or a completely clay molded body would be cool. 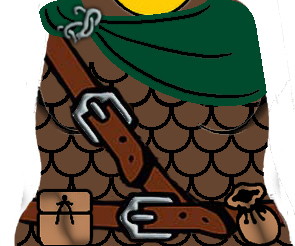 Re: Updated Female Archer & modded Lego bird. Hmm, interesting. The bird looks pretty good, actually. Maybe some more color would help. You know, it hadn't actually crossed my mind to use the brickwarrior wings as actual bird wings... rather than figure accessories. I wonder if a brick built bird might work better? I actually think the bird turned out pretty good. It looks like it's just swooping in for a landing. The wing connection points looks pretty good. I think I would try reshaping the "disk" at the base of the wing to make it look a little more natural though. I used black first because it is the easiest to do. I also have a pair of white wings and there are tan available still on the website. Maybe if I get bold enough I can try a multicolored parrot. I always wanted to see a blue and yellow one. I have seen brick built ones and they look great for decoration like I've seen Mark of Falworth use in some MOCs. I've always preferred molded animals to brick built ones. The next time I try it, I think I will drill the holes bigger so that the wings sit in deeper and look more natural. I originally wanted then to just attach so they could be movable and not have to be glued. Luckily, I used a dark gray bird as a base and those are the ones I have the most of and are the cheapest on BL I think. 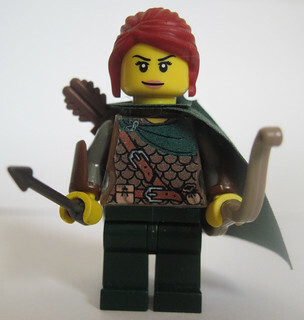 The female archer might be my favorite female minifig I have ever made to date. She needs a little bit of work, but I'm pretty happy with her. Nice! Where can I find that decal? Nice work! That bird is a little piece of genius. I uploaded it to Brickshelf for the time being. The decal seems to need resized slightly, but I just haven't gotten around to doing it. The curved torso template needs to be a little wider. She looks really good! I like that decal and the hair fits her really well also (might have to get one). Nice work!